Bing Ad Network is offering its new customers Free Bing Ads Credits Worth $100 . If you are planning to take your business to the next level , bing ads might be helpful for your business . Before you can redeem your coupon, you must have a primary payment method for your account. In general, postpay accounts can use credit or debit cards, and prepay accounts can use credit cards, debit cards, or PayPal accounts (only accounts with US dollar as the currency). You cannot redeem your coupon if you have a prepay account and pay by check, bank transfer, or wire transfer. 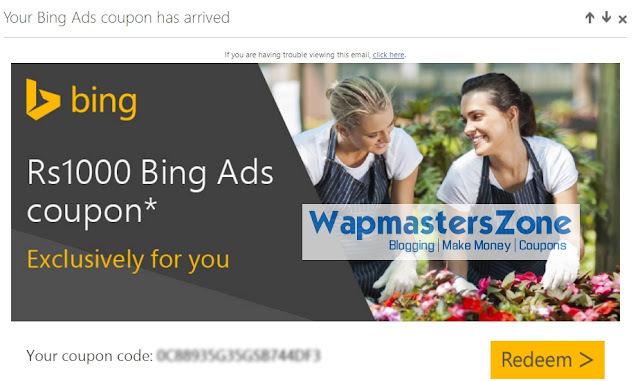 New customer promotion coupons must be redeemed within 30 days of signing up for Bing Ads . Once a coupon is redeemed, you have 90 days or until the expiration date to use the credit, whichever comes first. You need to spend the full amount before the coupon expires. You cannot use coupons to pay for an existing balance. After a coupon has expired or the coupon amount runs out, your ads will continue to run, and we'll charge your primary payment method (postpay account) or deduct funds (prepay account). If you have a prepay account and no funds are available, we'll pause the account. 2. Click the gear icon gear icon, and then click Accounts & Billing. 3. If you have multiple accounts, select an account from the drop-down list at the top of the page. 4. 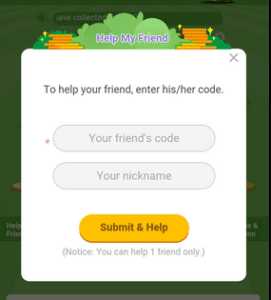 In the section called Coupon, enter the coupon code, and then click Redeem. 6. Click the gear icon gear icon, and then click Accounts & Billing. 7. Click the Payment Methods tab. 9. Select the country/region of your card's billing address and click Next. Next to Set as, select primary. 10. Enter your payment information and billing address, and click Next. 11. They will make a small authorization charge (for example, $1 USD) to verify your card. This charge will be removed. 12. Click the Accounts tab. In the section called Coupon, enter the coupon code, and then click Redeem. Has Your Site Been Hit By Manual Spam For Backlinking to Spammy Sites ? Did your Site Rankings Dropped due to Google Algorithmic Changes ? 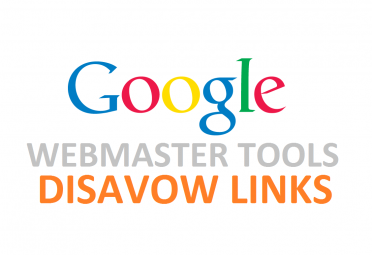 Google Disavow Tool May Help You Out To Get Back Lost Traffic From Google Search.Before we discuss how to use Google Disavow tool, We will give a brief introduction to Google Webmasters Disavow Tool. Google Disavow Tool lets Google Search Bots ignore spammy or negative baclinks to your site.This is an advanced feature and should only be used with caution. If used incorrectly, this feature can potentially harm your site's performance in Google's search results. We recommend that you only disavow backlinks if you believe that there are a considerable number of spammy, artificial, or low-quality links pointing to your site, and if you are confident that the links are causing issues for you . You can find backlinks to your site using many tools available online, while some are free and some are premium like Ahrefs Site Explorer & Backlink Checker which is most popular tool , also Moz's Open Site Explorer or Even from Google Webmaster Tools Links to Your Site Option. He’s telling you to use the Disavow Tool as a matter of routine link auditing. Cutts hates spam. So should you. Thus, to get rid of the spam and heroically battle the nefarious forces of the Internet, use the Disavow Tool. 2. Select the site from Dropdown List which you want to analyse backlinks. 4. You will find all backlinks to your site and also the linked pages from a specific domain to your site. 5. Now you can check if there are any suspicious or spammy backlinks and do some analysis on the backlinks by check alexa or whois data.Once you find spammy links , copy them to your notepad and create a txt file with only one url/line as shown below as per the google disavow tool format. 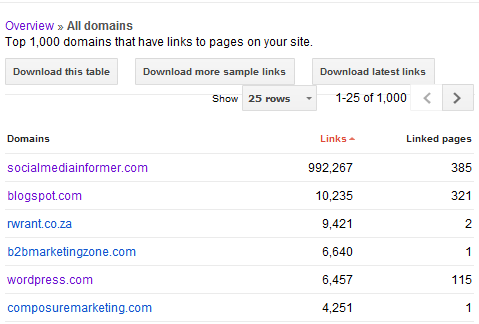 An Example Of Google Disavow File Format , Save it as links.txt or any name you want. 6. Select And Upload the links.txt file containing all the links you want google not to consider for your site. You have Successfully uploaded a disavow links file (links.txt) containing 0 domains and 2 Url.To Overwrite Links, you can upload a new file containing new links to Disavow tool. 8. Finally, hope for the best to happen if your site was really affected due to spammy backlinks. 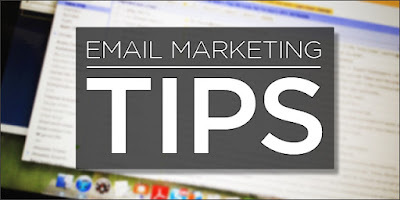 If you have got any Manual Spam Message for backlinks , then after disavowing the links , you should request for reconsideration with all the links you uploaded in the txt file in format specified below. As Seo is a long term process, Getting back your lost traffic is also not an instant process. Some Seoagencies claim to get traffic back in 3 days or q week after panda/penguin or Manual Spam, In relaity its a big lie.Google Disavow tool doesnt instantly remove penalties and boost your rank overnight, it takes some time in weeks or even months to see considerable results.Keep an eye on your webmaster tools search traffic to fin out if your site got its lost traffic. Managing social media accounts is not an easy task as it seems to be . There are many social tools available on the Internet to manage all your social media accounts at one place and also schedule posts for the accounts . Most of these services are premium services like HootSuite , SocialOomph , BufferApp and more . In this post, we will be talking about a free twitter RSS poster service which lets you post RSS feeds of any site to your twitter accounts fro free . You can add more than one twitter accounts also and automize the whole posting process . [Updated] As TwitterFeed has been discontinued..
1 . Log In to you DlvrIt Dashboard . 2. 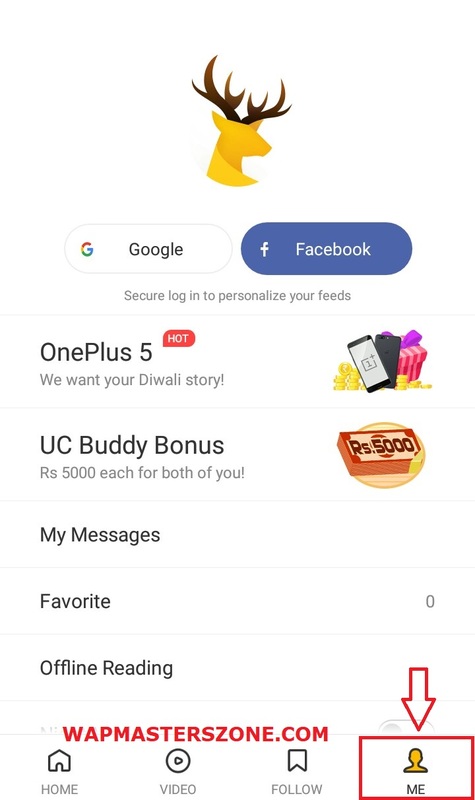 Click On Add new feed , you will see the below screen . 3 .Now you can Search for Feeds which are saved with DlvrIt , Or If you cant find your favourite site feed , Then visit your favourite site and Search for their RSS Link or Feedburner Link . 4. Copy and Paste the Feed Link to the Input Box Below Find a Feed ,It will search and Show you the Website title for the Feed . to connect to twitter . 6. Select Your Twitter Account and Save . Your Feed will be checked at regular Intervals and Will Be Posted With Images in your Twitter Timeline . 7. You Can Add multiple Feed Sources and also Social Accounts . ATTENTION: Twitterfeed will be shutting its doors on Oct. 31st. Now , Login to your TwitterFeed Dashboard . Click On Create New Feed to add a feed URL for automated posting . Also , If you like to post external RSS feeds to your twitter , facebook or other social accounts , then you can find the RSS feeds in a simple way ! Just Open any Site Homepage you would love to find RSS feed , and Click CRTL + U , this Will bring up the Source Code . The link marked in yellow color is the feed URL , you can either use anyone of the URL to add it to twitterfeed or any feed services . [Recommended For You] : Get Targeted Twitter Followers Using SocialOomph ! Once you find the link , enter it into the RSS/Feed URL textbox. Twitterfeed also provides additional options , you can get them by clicking on the Advanced Settings link . You can set Update Frequency from a minimum of 30 minutes and also the links to be posted per update . Once you have done with these options , you can move up to the next step . Twitter , facebook , LinkedIn , LinkedIn Company Page and App.net Services . Select any of the services from the list and you should give permission to the app to post links on your behalf . Once you connect your accounts , you have the option to choose the facebook pages you would like to post or the twitter/linkedin account . Once you are done up with all steps , you will see a congratulations message , which means you have successfully added an RSS feed to post it to the social networks . You can check the status of the feed if its active or inactive in your twitterfeed dashboard . Hope , this article will help you in case you are in search of automated posting of RSS feeds on social networks . Still Have any Doubts Or Questions In This Regard ? Do Let Us Know In Comments Below ! Black Friday is The Biggest Sale On the Internet , for All Digital Products Specially . One Can get simply the Best Deals On Web Hosting , Domains Names , Seo Tools and Many More . NameCheap combines SSD technology with the latest hardware, to bring you revved-up site performance that comes in under budget. In most cases, the Shared Hosting is 50% faster than the other guys. NameCheap is an independent (ie, not owned by a big holding corporation) an ICANN-accredited domain name registrar founded in 2000. In addition to domain registration, they offer a complementary spectrum of hosting services. Namecheap operates from a number of datacenters across North America and Europe. The redundant architecture provides a stable and resilient platform for our domain registration services, web hosting services, our email cloud and our associated services such as FreeDNS and URL Forwarding.